The Royal 10 is another giant in the typewriter market. Like the Underwood 5 it is one of the machines that essentially marked the end of the history of typewriter development. Machines like the Royal 10 continued to be built for many decades, with most changes limited to cosmetic alterations. The Royal 10 was introduced in 1914. It had two bevelled glass panels on either side of the machine. A later version only had one glass panel on either side. It is not clear at what point exactly that change was made. However, the machine presented here, with two glass panels, has a serial number that fits a production date in 1923. This is exceptional, because most of these machines with double glass panels have serial numbers from the first production year. 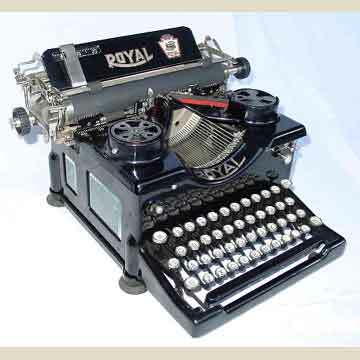 The Royal 10 was marketed as being the sturdiest and strongest typewriter around. To underline the point, the Royal company even organized stunts, where it threw typewriters (in crates) from airplanes, to show that they would even survive a fall. Note the closed bottom on this machine (pict. 6) that has a thick layer of felt on the inside, to reduce the noise of the typewriter.